I can’t believe I have been making a pizza a week for almost 18 months, but never put asparagus on one. There have been a few times that it has crossed my mind, but it never seemed right. So tonight I set out to make a pizza with the primary goal of using asparagus. I started by marinating chicken in a lemon garlic marinade. Then I placed a small amount of garlic and herb basting oil on some fresh asparagus. Andrew grilled the chicken and asparagus. Then I quickly chopped the toppings into bite sized pieces. Next, we grilled the dough for four minutes, then flipped it over and topped the pizza. I spread a light coat of olive oil on the dough, then sprinkled on feta cheese, and lastly arranged the chicken and asparagus. We let the pizza grill for about 4-5 more minutes before taking it off the heat. 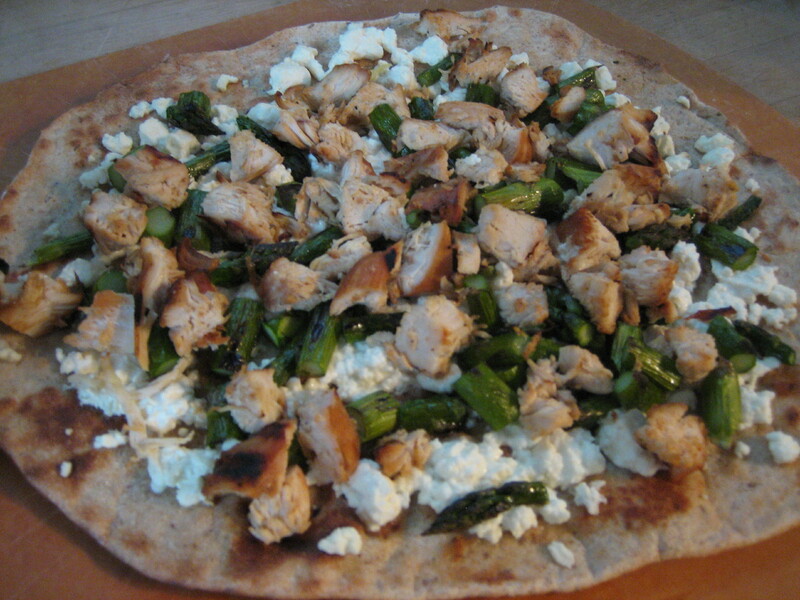 The flavors of the feta cheese along with the grilled chicken, asparagus and the crust combined so well and made this pizza taste amazing! This entry was posted in asparagus, cheese, chicken, feta, grilled pizza, meat, pizza, Seasonal, Spring Recipe, Summer Recipe, veggie and tagged asparagus, feta cheese, grilled pizza, pizza. Bookmark the permalink.